City sidewalks–busy sidewalks dressed in exhaust and smog. Take these paths instead. Known as "the lungs of Metro Manila," the La Mesa Watershed Resort and Ecological Park in East Fairview offers runners a respite from the smog-infested streets of the city. The park is open everyday from 8 a.m. to 5 p.m., but it's best to go on weekdays, as the park tends to get crowded during the weekends. For only 50 pesos (P40 if you're a QC resident), you get to breathe in the fresh air as you run through trails with varied terrain. You can opt to run on the road around the park or go into the forested mountain bike trail. The entrance is near the Petron Fitness Trail and the butterfly garden, so you might just see some of the colorful butterflies accompanying you on your run. For an added challenge, run up more than a hundred steps that lead to the La Mesa Watershed, Metro Manila's primary source of drinking water. The dam is off-limits though so once you hit the fence bordering the dam, it's time to run back down again. How to get there: From Commonwealth Avenue, turn right at East Fairview Subdivision's Winston Street (after Mercury Drug Store). Turn left at Dunhill Street and go straight till you reach the entrance to La Mesa Eco Park (www.lamesaecopark.com). Rows of towering trees line the streets of these two universities in Quezon City. Aside from providing runners with shade from the sweltering heat, their presence offers a sweet-smelling breeze. For a full workout, run the perimeter of the Ateneo campus, passing the Blue Eagle Gym and the Church of the Gesu, all the way around Bellarmine field. It's best to run before or after school hours to avoid heavy traffic. In UP, one can run around the 2.2 km academic oval, which has one lane exclusively for bikers and runners. (The whole road is closed off to motorized vehicles on Sundays.) But for a more scenic and challenging route, run around the outer periphery of the campus (You can try the route used by UP mountaineers for their qualifying runs). UP also has a lot of large gardens and lagoons, so if you're feeling adventurous, go ahead and blaze your own trail. Be sure to have some fish balls, kikiam, and a fresh cup of taho (or two!) after your workout. How to get there: Ateneo de Manila University is along Katipunan Avenue. To get to UP Diliman from Katipunan, turn left to CP Garcia, then turn right at the next intersection. Turn left at the end to get to the UP academic oval. A favorite venue for road runs and marathons in Metro Manila, Fort Bonifacio offers routes for all runners, whether beginner or advanced. Since traffic is relatively light, the area is not as polluted and more peaceful than most city centers. For easy runs, one can simply run around the 1.2 km outer ring of Bonifacio High Street. But to really test your limits, try going all the way down to Bayani Road. Once you reach C5, make a U-turn and go back up Bayani Road, down to McKinley Hill. When we say McKinley Hill, we really do mean hill, as the steep inclines will put your strength and will power to the test. For most of the route, you can easily stick to the sidewalks to avoid vehicular traffic. But once you go down to Bayani Road, be careful as the road can get rough and there are a few potholes. It's best to run before the sun comes up as the air is still cool and there are very few cars on the road. After your run, try the Runner's Breakfast Tray at Paul Calvin's Deli (www.PaulCalvins.com). For P230, you get eggs, sausages, pancakes, toast and orange juice. But if you're on a budget, the King's Special in Chow King works just as well! How to get there: From C5, turn right into the service road going to Fort Bonifacio. From EDSA southbound, turn left to McKinley Road, and go straight till you reach the Fort. A popular venue for concerts and big sporting events, this indoor sporting arena in Pasig city also offers a respite for runners who are tired of running on hard, paved roads. 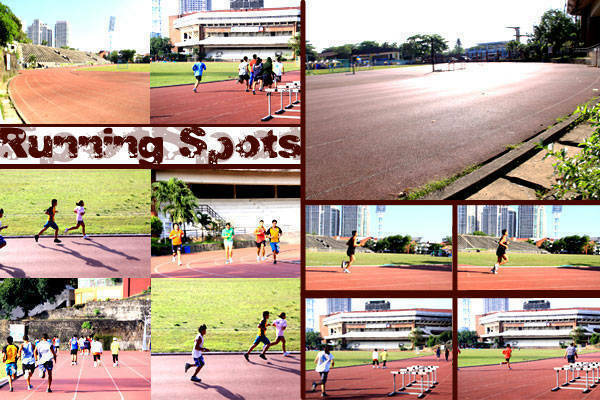 The 500-meter rubberized oval track is good for the knees and perfect for doing running drills and sprints. 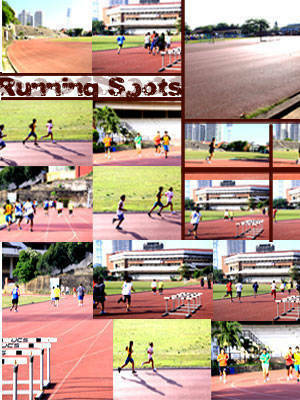 It's a popular spot for coaches to train their protégés and teach them the art of running. You can run anytime of the day until 9 pm when the lights close, but be sure to get your ticket (only 35 pesos) before the ticket booth closes at 6 pm. If the oval track is not tough enough for you, try running outside the perimeter of the oval. The steep inclines inside the PhilSports complex will surely test your mettle, without exposing you to the elements. After you run, you can go for a dip in the Olympic-sized swimming pool or have some of Aysee's famous sisig, right outside the complex. How to get there: From Ortigas, turn to Meralco Avenue and go straight until you see the entrance to PhilSports Arena on your left. It's not just the biggest mall in Asia, it's a great starting point for runners too! Across the Entertainment Mall is the promenade–a wide sidewalk right beside Manila Bay. Running here in the early morning gives you a whiff of the salty sea air. You'll probably also see dragon boaters training at the bay and various groups doing their morning exercises. Just be sure to look where you're going though, as there are a lot of cyclists there in the morning. If you prefer to run in the late afternoon, the famous Manila Bay sunset is no less spectacular. Nothing beats racing against the sun as it sinks into the water, its glimmering red-orange rays bleeding into the sky. You can choose to run around the perimeter of the mall passing the esplanade and the Shrine of Jesus, or go all the way to CCP. From there you can run towards the Rizal Monument and pay a tribute to the country's national hero. How to get there: From EDSA, go straight to the end crossing Taft Avenue and Roxas Boulevard, until you reach the huge globe of SM Mall of Asia at the end.